The only difference compared to the FM 77 AV seems to be an improved 3.5" disk-drive with a capacity of 640 kb. 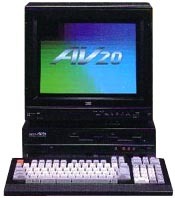 Like the FM 77 AV, there were two models : the FM 77 AV 20-1 with one disk-drive, and the FM 77 AV 20-2 with two. see more Fujitsu FM 77 AV 20 Ebay auctions !